What Pieces are YOU picking up? One way of interpreting David Brinkley’s quotation is to understand you have to be self-reliant in your life. You Choose Who You Want to be Known As at any given moment of time. Sometimes we surprise ourselves and other times it a great effort to work through whatever process is before us. The question becomes. What pieces are you picking up in your career? The photo above could be seen as plastic pieces on asphalt or another mixed media art project in the making, or a schematic design of a puzzle maze or magnified pieces of broken glass. 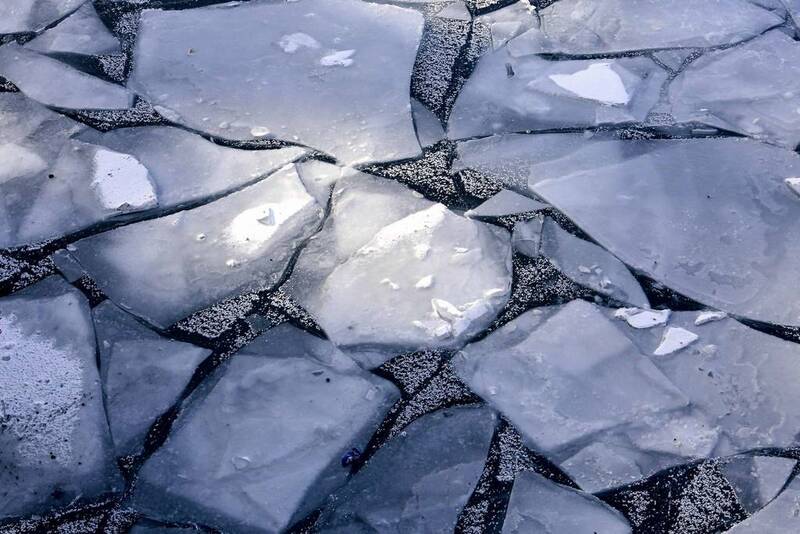 The reality is, it is a cracked ice formation on the Chicago River. What we see is perception. Our perception is formed by past experiences, the present moment, the time of day, our culture and our values. How mindful we are of our emotions and the emotions of others will drive our perceptions as well. If you had to pick up pieces today that were left by someone else, what would your first step be? Pick up the pieces, finish the task and then move on. Ask someone for assistance because the job entails more than you are able to handle at this moment? or, walk away from the pieces and let someone else take care of it because it’s not your responsibility anyway? Since the readers of this blog come from so many professions, there is no correct answer. If the pieces are left for you to deal with this week, Choose Who You Want to be Known As. Best of luck as you choose! This entry was posted in Business, Career Concepts, Career Management Coaching, Careers, Culture, Entrepreneurs, Ethics, February, Jo Ann M. Radja, Millenials, Mindful, Organizations, Perceptions, Personal Growth, Reflection, self-manage, Strategy, Team Fairness, Thought Process, What pieces are you picking up? and tagged Business, Business and Economy, culture, David Brinkley, First steps, Perception, Thinking, Values by Jo Ann M. Radja. Bookmark the permalink.